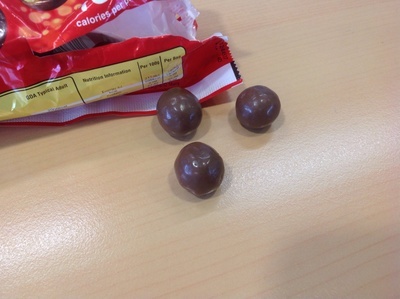 Maltesers are a classic American chocolate made by Mars. Milk chocolate surrounds a crunchy malty honeycomb centre which is hard to describe, but it's like eating a solid malted milk drink. 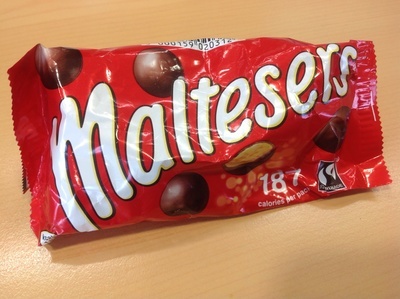 Actually, that doesn't sound very nice, but Maltesers are. They also claim to be lighter than ordinary chocolate, at only about 137 calories in a normal-sized bag. They've always been aimed at the dieting market, when first invented they were described as "energy balls" with slimming women as their target market. I'm not quite sure how effective they will be, as they're very moreish - I could easily eat a whole box in a sitting! Indeed, the bigger boxes are good for sharing, and Maltesers are often used as part of a tray-bake, so if you don't like the flavour (it is a bit of an acquired taste) you could use them up in that instead.